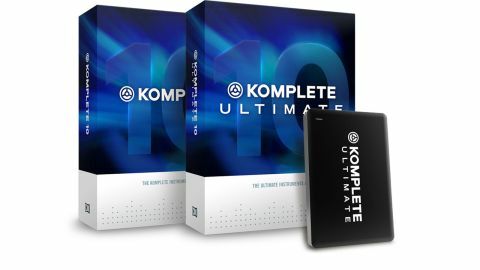 Komplete 10 Ultimate remains the most comprehensively spec'd bundle available today. An unparalleled collection of instruments, sounds and samples. Polyplex, Rounds and Kontour are valuable new Reaktor instruments. Komplete Kontrol plug-in allows rapid browsing of entire bundle. Pricing is steep for version 9 upgraders. There's an awful lot to like about Native Instruments' product range. If you're a synth fan, you'll be aware of Massive and the extraordinary impact it has had on Dance music in the past few years. You'll probably admire Absynth 5 and the FM8 too, whilst Reaktor's own libraries of instruments now extend to high-profile titles including Razor and Monark. "If you're not yet a Komplete user but have been yearning for one of the bundles, there has never been a better time to buy"
If you're a media composer, you'll no doubt have had your head turned by Kontakt's exceptional array of piano, strings, brass, drums and percussion libraries, to say nothing of the fact that Kontakt is established as the weapon of choice for third-party sample library developers. And for guitarists and mix engineers, Guitar Rig 5 and the extended range of individual and bundled effects processors offer plenty of cherries to place atop your perfectly crafted sonic cakes. Individually, these titles are powerful enough but, bundled together, they offer an unparalleled suite of production tools in the form of Komplete. This is available in two new incarnations: the cheaper yet still generously appointed Komplete 10, or the more expensive 'all you can eat' buffet that is Komplete 10 Ultimate. The latter is on test here. In total, Komplete 10 Ultimate bundles 75 of Native Instruments' separate product titles, which add up to over 440GB of data. Installation, as per Komplete 9, is from a Read Only hard drive, from which content is transferred to your hard drive(s) of choice, replacing the need for 100-odd DVDs. The install took about four hours on our test computer but Komplete is authorised from a single code rather than individual ones for each library title, so, once installed, you're soon up and running. As is traditional, Komplete Ultimate 10 collects up and includes some titles which have been released as separate entities in the past few months, as well as offering some brand new ones. Three of the latter come in the form of new Reaktor Player synths, Round, Kontour and Polyplex. We'd exhaust our entire word allocation simply listing what's included, so for a full list, check out the Native Instruments Komplete site. Of particular note for media composers, Kontakt has been expanded in a range of sonic areas. On the film-composing front, Action Strikes, Rise and Hit and the Kinetic Metal libraries are included, the latter of which offers an engine to bend and evolve sound in thrilling ways. The Studio nature of Kontakt is boosted further by the inclusion of Session Horns Pro, the Cuba library and the hybrid DrumLab instrument, which lets you balance drum sources between acoustic and electronic base layers. Three new piano titles - The Grandeur, The Gentleman and The Maverick - further expand upon the options offered by Kontakt's already impressive ivory-tickling options too. "What's clear is that Komplete continues to go from strength to strength"
On the effects front, the Tube Saturation Compressor SuperCharger GT is included, as is the Reaktor FX library Molekular, which provides a modular approach for effects processing and sound design. Also new is the Komplete Kontrol software which - as well as acting as the bridge between the Komplete software and NI's new Komplete Kontrol S-series keyboards - provides a launchpad for browsing all of Komplete's content from a single plug-in. This is invaluable as, until now, you've had to learn the assorted personalities of Komplete's instrument collection before being able to take a 'best guess' at where to find sounds which might suit your productions. Now, you can choose from target 'keywords' and Komplete will list suitable sounds from across its titles. So, what's clear is that Komplete continues to go from strength to strength, bundling new libraries with those present in Komplete 9 and, more valuably still, creating new instruments for Reaktor which will prove hugely popular. If you're not yet a Komplete user but have been yearning for one of the bundles, there has never been a better time to buy. The extraordinary discount offered when comparing the prices of individual NI titles with those included in the bundle is beyond compare. However, if you're updating from Komplete 9, you might pause and look at the £339 upgrade price, which seems a little steep. For this, you gain Rounds, Kontour and Polyplex, several new Kontakt libraries, effects like Molekular and SuperCharger and more besides. If all of those titles appeal to you, £339 is still a good price compared to the individual costs of each product but, in keeping with the total package price, we're a little surprised the upgrade isn't £50-£100 cheaper. Of course, if you're upgrading from a previous version of Komplete, the word 'bargain' can again be used more liberally. What's not in doubt is that Komplete Ultimate remains a class leader. If you're a producer or composer whose work spans a range of musical genres, Komplete 10 continues to offer itself as the ultimate sonic toolkit.